ესკიმოსეფი — ოორუე-ბჟადალ ცჷნდჷრიშ, ოორუე ალასკაშ დო კანადაშ აბორიგენი მახორობა. ესკიმოსეფი ჟირ დიდ ბუნათ ირთუნა — იუპიკეფი დო ინუიტეფი. თე ბუნეფწკჷმა არხო რსხუს რე უნანგამიშ კულტურაშ მაპალური კათა - ალეუტეფი. იუპიკეფი ოორუე-ბჟაეიოლ ცჷნდჷრს დო ალიასკას რენა გოფაჩილი, ინუიტეფი — კანადას დო გრენლანდიას. ანტროპოლოგიურო ესკიმოსეფი არქტიკულ მონგოლოიდეფს ორხველჷნა. Kaplan, Lawrence D. (1990). "The Language of the Alaskan Inuit", რედ. Dirmid R. F. Collis: Arctic Languages. An Awakening (PDF), Vendôme: UNESCO, 131–158 გვ.. ISBN 92-3-102661-5. Menovshchikov, Georgy (= Г. А. Меновщиков) (1990). "Contemporary Studies of the Eskimo–Aleut Languages and Dialects: A Progress Report", რედ. 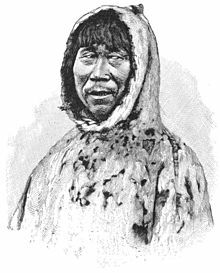 Dirmid R. F. Collis: Arctic Languages. An Awakening (PDF), Vendôme: UNESCO, 69–76 გვ.. ISBN 92-3-102661-5.
თე ხასჷლაქ ეკონიას გეახალუ 22:12-ს, 19 ღურთუთა 2017-ის.